After spending some time in rl, at work, listening to turn of the century recordings of Nellie Melba and La Nina de los Peines (the Girl of the Combs) I’ve acquired a hankering for my very own table-top Victor-Victrola. 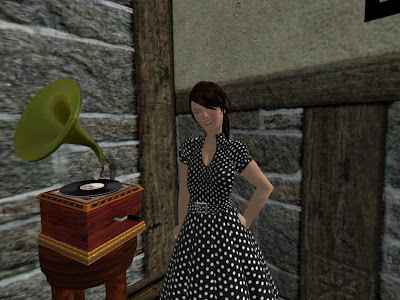 At the same time, in sl I’d been trying to figure out a way to stream music on my land. I fiddled with a transistor radio that I could plug internet radio stations into but the streams hiccupped and the stations I gathered tended to go defunct in a matter of days. I finally found the most fantastic internet radio service – and it’s in Victrola form! I must plug the Internet Radio V6 by Alvargi Daniels. Not only does it come in this gorgeous Victrola form (the album charmingly spins 'round), its ability to track current streaming radio stations, worldwide and mainly commercial free, is amazing. Type in a subject term like “flamenco” and 50 radio stations that feature flamenco music will pop up for you to choose from. I now tinker at home with fine music to keep me sedate, enervated or entertained. Hurrah! See: http://www.alvargi.com/ to read more.